Editor’s Note: Written by Safiyyah Muhammad. The views expressed in this commentary are solely those of the author. My favorite channel is BBC World News. When I put on the TV, I check in with it first before navigating through what other channels are airing. Yesterday, as soon as I got returned home, I quickly went to BBC. I was in time with the headlines at the top of the hour. 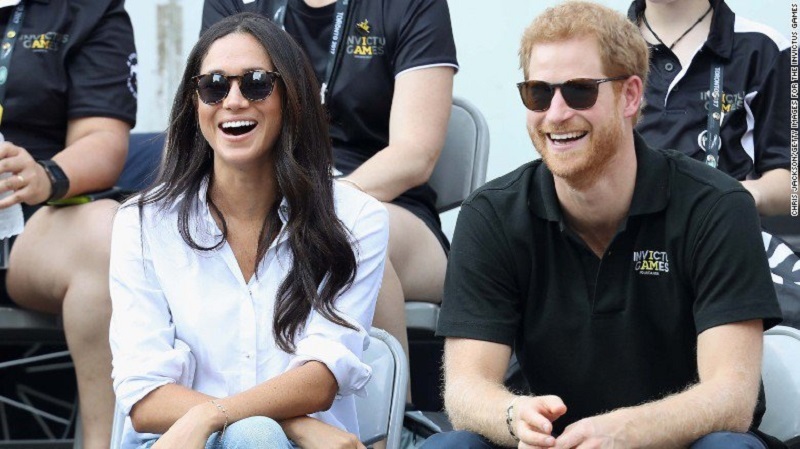 Suddenly, a breaking news interrupted the stream of flow: Prince Harry was engaged to American actress, Meghan Markle. That caught my attention because I remember a few months back how he publicly criticized the media for embarrassing her. Then I heard she was a divorcee and 36-years-old. I had to quickly search Prince Harry’s age when I realized she was three years older than him. Setting aside the sense of materialism that comes with royal wedding celebrations and the obvious worldliness considering both individuals are celebrities, this union could not help but remind me of parts of the Prophet’s life and those of his companions. In one of their interviews, I noticed that these two were not just in love with each other, but seemed so comfortable with themselves, and were friends. They kept looking at each other as if to seek an approval before answering the reporter’s questions. The two truly looked adorable, and their relationship seems to emulate one of trust and friendship, values that the Prophet (PBUH) harbored. Just when I was thinking how lucky Meghan must be, it struck me that she was actually a divorcee. God knows what went down in her first marriage. And it donned on me how well the light at the end of her tunnel shone. This reminded me of a female companion during the time of the Prophet Muhammad (SAW) by the name of Umm Salama, who lost her husband. She was so devastated because he was an amazing man, that she couldn’t think of anyone who could replace him. Yet, in Islam, we are taught that when God takes something away from you and you meet the adversity with patience and faith, that He compensates you with something better than what you lost. Umm Salama believed this, but she kept asking herself who could be better than her beloved late husband. Eventually, she married the Prophet. What man was or is better than our Prophet? None. She was indeed compensated. I am unmarried, and over 30. I have had my own fair share of relationship workings and not workings. Each time I have to painfully leave someone because it isn’t working, or there’s just something I can’t cope with, the next guy to come will almost always be better than the previous – despite the fact that at the end of the relationship I always wonder if anyone could actually replace the one I’m leaving. I’m not looking to discover Mungo Park, but I sure am looking for the one who suits me just right. Congratulations Prince Harry and Meghan Markle. It appears that you were both blessed to have found the one that suits you just right. We deleted 18 spam messages. This engagement doesn’t resemble Muhammad’s relationship with Safiyah bint Huyayy, the Jewish woman he, ah, married after killing her loved ones? Nor with Rayhana bint Zayd ibn Amr who he did marry after enslaving her, after killing her loved ones? Seriously – no one suits anyone “just right.” Perfection is overrated – and newsflash, even the man (especially the man) you call a prophet was quite short of perfection and kindness. Relationships must be formed with honesty to have longevity (unless forced, like in the aforementioned examples). You aren’t being honest with yourself. Pull away the smokescreen and open your eyes. To borrow the idea from someone else – Think like no one is watching. Then see what happens. I used the word “doesn’t” (resembke) and not “does” (resemble). If you read my entirre post, you’d understand my point. I don’t think you want to understand. That’s unfortunate. People like Nessie who read parts from I hate Islam.net think they can comprehend the marriages of the prophet to say the least, and then you have here a Muslim who is trying to compare it to the disgusting royal family who scrounge off our taxes just to afford their wedding. Please explain Muhammad’s relationship with Safiyah bint Huyayy. And while you’re at it, with Rayhana bint Zayd ibn Amr and Juwayriyah bint Al-Harith. I wonder, if Jews are the ancestors of “apes and pigs,” and whereas the followers of Muhammad destroyed much of the Jewish population in the Middle East, killing the men and forcing the women to carry the babies of the (Islamic) killers, those babies are descendants of Jews, even if forced to practice Islam (for every generation after). So, many, many Muslims have ancestors that were Jews before being consumed by Islam, especially in Saudi Arabia. Do such Muslims with Jewish blood stop being the ancestors of apes and pigs after they’ve been converted to Islam, or does that conversion magically change DNA? I am curious. These are horrible accusations and a little light on them would help to clarify. Following your advice, I looked at Michael Hart’s introduction, available at Amazon. I haven’t read his section about Muhammad, yet, but see that his introduction clarifies that this is a book about the most influential men, not the greatest men. Just thought I’d do the courtesy of letting you know that your evidence might not be working to prove the point you want to make – should that matter to you. It all comes down to idolisation of Muhammed; the very thing that Allah supposedly warns against. The whole premise of the religion falls apart on this point alone. Muhammed invented Islam for political reasons and he is nothing more than the dictatorial element of the fascism that Islam is. He makes other fascist leaders look like boy scouts when you consider that fascism was contained within their respective countries, whereas Mohahammed managed to engineer generations of brainwashed Muslim drones, roaming the planet and messing it up. Even he wouldn’t have wanted this. What a farce Islam is. It bothers you a lot more that you think I mentioned the wrong woman’s name (I did not) than the fact that a man people forced into a faith are forced to think is perfect upon pain of death, hurt A LOT of PEOPLE really badly. Realistically, most women he forced himself on were no more fortunate than the poor Yazidi girls abused daily by those who emulate him. Calling me names doesn’t change facts. Yes – think like no one is watching. You’ve been blessed (as we all have) with an individual mind, capable of processing individual thought without other human beings dictating to you how that should go. Many put a lot of effort into controlling your mind and thought. Does a man who abused so many really hold the monopoly on virtue – has he convinced you that is true? Of have you just been too bullied into believing it is so. Most men who pillage villages, sell children, r ape women, slice limbs and kill people to control thought are typically looked at as criminals – all but one. Why? I truly mean no disrespect, I just get very frustrated when I see the results of what happens when people follow the ritual methodology and set of laws dreamed up by a psychopath. It is harmful to the human development of “believers” and to the security of “non-believers.” Look at the world, what good has it done? Yaya, I know – the reward is in the after life, in paradise. Come on. I find organizations such as Ex Muslims of North America to be a beacon of light on humanity and I hope very successful in their mission, as happiness on the Earth we know is a greater gift from our Creator and to our Creator than destroying His planet and people, per order of some ancient man who said He said to do it, in exchange for indulgence in a place we don’t know exists. WTF? what sort of desperation is this? The similarity is the same as between a table and a dog, because they both have 4 legs. She is understandably trying to make normalcy and healthy development seem applicable to her faith. It isn’t easy to accept that it is one of ritual methodology and a set of laws dreamed up by a rather unwell man with an abundance of psychopathic tendencies. The global results are horrific. It is much easier to make up a love story than to face reality, but the latter will produce greater happiness in the long run. So says a man who has zero knowledge of what Islam and life of its prophet really is. Your hatred for Islam fed by your highly biased mainstream media will take you nowhere. Its better to get your sources right if you really need to learn about Islam. If not then you are doing a great job in hate mongering. This is what you do when you are a colonized muslim impressed with the modern western civilization. All one can say is Inna lillah wa inna ilyihi raajioon. This is a disgraceful ad hominem attack on a fellow Muslim, engendering division amongst the Ummah at a time when solidarity is needed more than ever. Please educate yourself in Islam before spreading hatred on here again. Start with Surah 8:46.